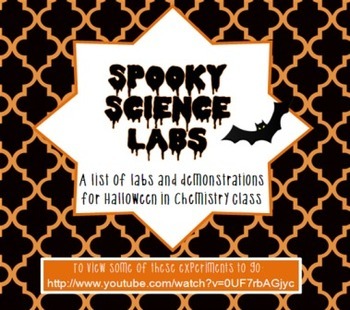 In this pack there are nine different spooky science labs that you can perform for and with your students. 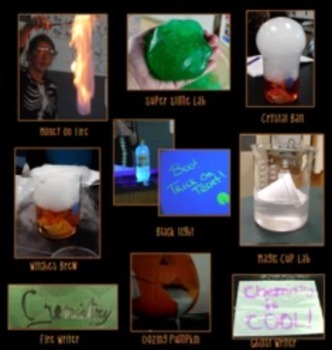 (Two of the labs include multiple versions so there are 11 different labs) All of these labs are exciting and will help to spark your students love for chemistry. 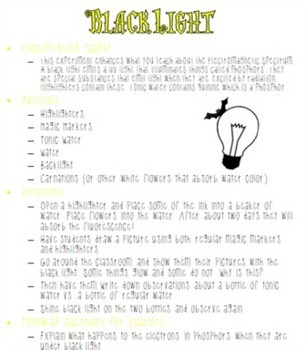 They also each include an objective/purpose topic that relates to the chemistry curriculum. Most of them use household items and some require materials that most schools keep in their chemical supply rooms.Students love to explore and this day of experiments gets them doing just that! They will certainly never look at ‘magic’ the same again, they will think about the science behind it!All of the labs include an objective, an explanation of the science, directions, materials list, clean-up, safety information and follow up questions for students. There are also pictures included (also in the Preview). Includes topic like catalysts, oxidation, pH Indicators, states of matter, polarity, phase changes, electromagnetic spectra, combustion, specific heat.